We offer budget accommodation in Haifa: Hotel, Hostel and Holiday Apartment. Port Inn Guest House is suitable for families, couples and individual travelers. Whether you're a family on vacation, a couple traveling in Israel or a backpacker touring the Middle East, we have different kinds of accommodation to suit your needs. A reservation is only complete upon receiving an official confirmation letter from the Port Inn. Changes to the reservation should be made in writing and confirmed by the Port Inn. Check in starts at 14:00 (noon) until 22:45. Check out is at 11:00 in the morning. Guests who check out may use the lounge and computer facilities and store their bags during reception hours, however, they may not go upstairs to the rooms. Guests who are Israeli citizens: rates don't include VAT (17%). Acceptable payment methods are: Credit or Cash (Israeli Shekels). For a cancellation of the reservation made up to 7 days prior to arrival, there will be no cancellation fee. Please note that a cancellation should be made in writing and confirmed by the Port Inn. For a cancellation made less than 7 days prior to arrival you will be charged for the 1st night of stay. Please note that a cancellation should be made in writing and confirmed by the Port Inn. I had a wonderful stay at Port Inn! It's well located near plenty of new, fun restaurants by the port; walkable distance to the Ben Gurion st, the Baha'i Gardens, and more. The breakfast was the BEST included breakfast I've had in a hotel or hostel maybe ever. The garden is a lovely place to sit and do work or drink a cup of tea. 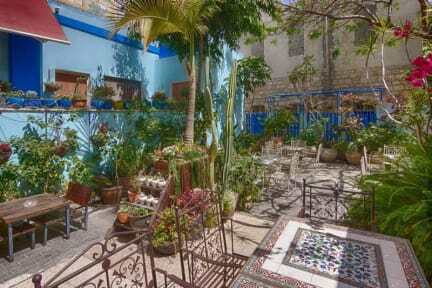 Fantastic hostel and the location is the best because it's an easy walk to many local sights. The staff was very friendly and knowledgeable. Our room was super clean, the bed was really comfortable and we had wifi. 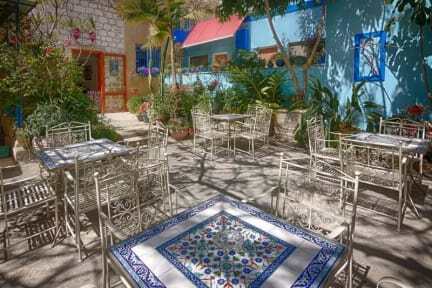 There's also a very nice patio area with tables where we enjoyed breakfast and later wine in the evening. The kitchen is small but has everything you need and everyone was really good about keeping the area clean. There's also a very comfortable lounge area with cable tv. Wonderful location and extremely nice room facilities. Best breakfast in the whole trip in Israel than ever. And I really love that stylish restaurant next to the lobby. Great boutique-y hostel. Friendly, helpful staff. Felt very safe and comfortable. Good breakfast variety and lovely garden to sit in. Conveniently located very close to the train station. Neat and tidy. Very helpful staff members who'll happily assist you with drawing up your travel plans. Breakfast was great with plenty of options. Overall, a nice place but perhaps not that great on value for money, especially if you are booking private rooms. Surprisingly, some private rooms do not have an enclosed shower and WC - so a little care must be taken while making the reservation. It's by far the best place we stayed in Israel in our two week trip. The hostel is clean, neat with great location, an awesome included breakfast and very well maintained facilities (check the laundry room, one of the best we've encountered in any hostel around the world). + Breakfast is great - Israeli cheese, vedgetables, eggs, bread and croissants, muesli, juice, etc. + Good location + Clean and large rooms - Atmosphere is ok, but a lot of Russian group travellers, which did not talk too much. First some of the staff is not really welcoming. Thanks God there his the ladies taking care of breakfast really nice smiling laughing help. Really small kitchen and kind really close to a bar who plays super loud music often pass 4 am. There is no locker in the room.